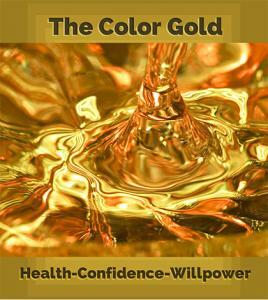 In this series, Boomers Know How will look at what colors mean, and how various colors influence our lives. Deep purple is associated with nobility, luxury and wealth. Purple is distinguished and commands respect. It was the favorite color of Egypt�s Cleopatra. The color purple stimulates the imagination and encourages deep thought. It is the color of creativity. Purple is a very spiritual color. It signifies morality and high standards. Purple is a prominent color for the church seasons of advent and lent. Purple will support the practice of meditation and bring harmony and balance to the mind. Color therapists use purple to lower blood pressure, and to detoxify the body. Purple is an unusual color that possesses both warm and cool properties. Strong-willed leaders see purple as representing ambition and courage, yet it is also a color related to benevolence. Take a moment to look at the color purple in the image used to illustrate this article. How does it make you feel? 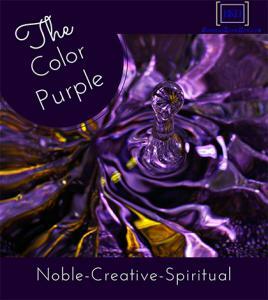 Use your reactions and feelings as a guideline to where and when you use the color purple. The color orange excites the senses and invigorates the body. Orange symbolizes optimism. It will rejuvenate and uplift the spirit. 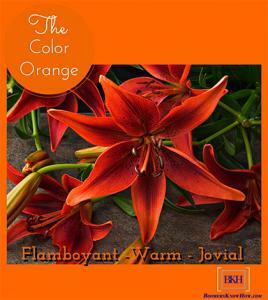 Warmth, happiness, creativity, pleasure, and intimacy�these are all terms associated with the flamboyant color orange. Color therapists use orange to inspire joy and counteract depression. Restaurants use shades of orange to stimulate the appetite and encourage community. Orange is also the color of the extrovert, the adventurer and risk-taker. It inspires confidence and independence. Orange stimulates a creative flair for new ideas, a sense of enthusiasm, and spontaneity. Take a moment to look at the color orange in the image used to illustrate this article. How does it make you feel? Use your reactions and feelings as a guideline to where and when you use the color orange. 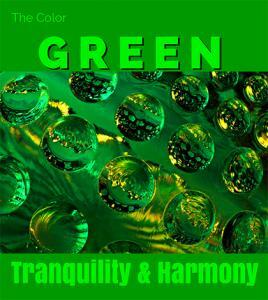 The color green brings a sense of tranquility and peace, balance and harmony. We see green spaces as sanctuaries of wellbeing. Green in our environment has the power to relax us both mentally and physically by calming our emotions. Green is the color of healing; green surroundings help alleviate depression, nervousness, and anxiety. Green is the most prominent color in nature thus symbolizing renewal, spring and growth. Green is believed to be the most restful color for the human eye. Green is also the color of prosperity and abundance. Green implies stability and endurance. Take a moment to look at the green in the image used to illustrate this article. How does it make you feel? Use you reactions and feelings as a guideline to where and when you use the color green. Pink is the universal color of love and romance. Vibrant tones of pink are sensual and passionate, and bright pinks increase your pulse rate and cause energy to surge. Pink is the color of hope and happiness. It represents compassion and nurturing. Pink is associated with thoughtfulness, caring, warmth and comfort. These characteristics promote a sense of calm, and can alleviate feelings of anger and resentment. Pink prompts relaxation, acceptance and contentment. Take a moment to look at the pink in the image used to illustrate this article. How does it make you feel? 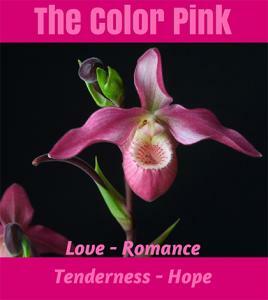 Use you reactions and feelings as a guideline to where and when you use the color pink. Blue is known to open the flow of communication and broaden one�s perspective to learn new information. - Blue tends to dampen the appetite, so use it sparingly in kitchen and dining areas. What do you get when you are stuck in stop and go traffic�6 lanes wide each way�during a typical rush hour on the Los Angeles 405 Freeway? If you are the driver, you get a stress-induced headache. For passengers, it�s a boredom-induced coma. This is especially true at night when the only scenery is a blur of headlights and taillights. That is unless you�re a photographer stuck in that passenger seat. Especially if you happen to have a camera in your lap when curiosity strikes. What would happen if you stuck that camera out the passenger side window and started taking pictures? The car you�re in accelerates from a dead stop to 60, 70, 75 miles per hour, and then instantly back to a crawl�only to accelerate again. All the while, there are cars within an arm�s length in all directions. There are cars everywhere. Cars packed like sardines 6-lanes wide in each direction. Cars packed onto on ramps, off ramps, and overpasses�all lit by streaming headlights and taillights. And there I was, arm stuck out the window, camera in hand. Step one: take a picture, step two: review and evaluate, step three: change camera settings, step four: repeat step one. 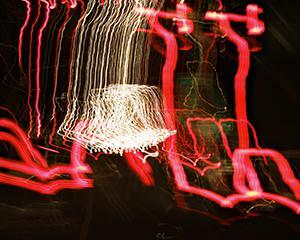 After some experimenting with a variety of camera settings amazing things started to happen. What my eyes saw as a sea of car lights flowing in all directions, the camera began to record as an amazing light show. No image the same, but each exposure feeding an all-consuming desire to do it again. And so it went, arm out the window again and again. It only came to an end when we exited the LA 405. The results? For me the images that I call Light Writing on the LA 405 are magical. 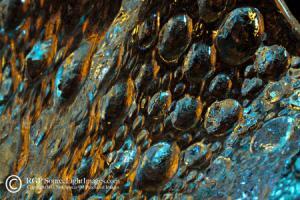 I find the dizzying array of colors, patterns, shapes and textures visually exciting. I also think they have a very modern look and feel that would enhance any environment where they are displayed. I hope you enjoy Light Writing on the 405. I hope to create more of this style imagery. Hope is the key word here. I truly believe magic happened the night I was lucky enough to capture Light Writing on the LA 405. So many things could have gone wrong; yet everything went right. A camera, a photographer, a set of circumstances that may never intersect again. Please click below to see the entire series. One of my most enjoyable tasks as a photographer is photographing oil and watercolor paintings for artists. It is a real treat to work with amazing art, and talented painters are a true source of inspiration. Artists need photographs of their work for reproduction, show entries, and for promotional efforts both in print and online. There are a few tricks to photographing artwork. You must light paintings evenly, correct color is an absolute necessity, and distortion is a big no-no. People have enjoyed the calla lily for hundreds of years. Long, smooth, graceful� are all terms used to describe these beautiful plants. My goal was to capture the elegance of these beautiful flowers in a unique image. I wanted to show the delicate shape of the buds with their fine linen-like texture. 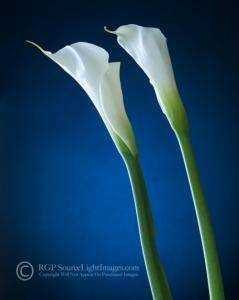 I also set out to create a quiet, serene image to emphasize the plant�s stately quality. I choose to bring two flowers into my studio and arrange them in a symmetrical presentation. The first challenge was to use lighting that would capture each bud�s delicate texture. It can be difficult to capture detail in an all white flower bud. First, you must place your main light to the side of the subject to show its texture and form. Side lighting emphasizes texture and shows form; front lighting hides texture and flattens form. Second, to capture fine detail in a light-colored subject you need soft, low contrast light. A large light source positioned close to your subject will produce the desired quality of light. In this image I positioned a large 30 x 40 inch softbox to camera left just out of camera view. Notice how the light gently wraps around the flowers emphasizing the shape and texture of the buds. Also notice the long, smooth highlight down each stem. 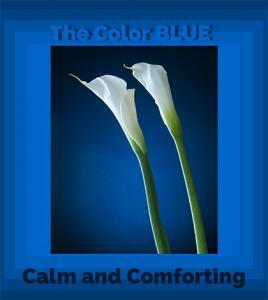 The blue background adds a quiet, serene feel to the presentation�just what I was looking for. I started with a dark blue seamless paper lit with a second studio strobe fitted with a 20-degree grid. The background light is another classic portrait technique. Lighting the background helps create a third dimension. A photograph is two-dimensional�length times width. A background light creates a sense of depth by visually separating the subject form the background. The 20-degree grid allowed me to direct light to a small area of the blue seamless paper. Without the grid the entire background would appear evenly lit with no falloff towards the edges. I think I have accomplished my goal. When displayed this image is certainly quiet and stately, and the shape and texture of these beautiful buds seems carved into the print. And if sales are any measure of success, this image has done very well. Should you be interested a print, please click below to access my gallery. What do you get when you combine two strobes, each with a different colored gel, plus a glass vase, plus a reflector, and last but not least� water? You get results like the Glass Works 05 image shown here. I created this image using a macro lens on my Canon dSLR without the aid of Photoshop filters or any other digital techniques applied in post processing. The image you see is as it looked when captured. If you ever get the itch to create images that are otherworldly, this technique offers limitless possibilities. Click below to see additional Glass Works images.